Nothing quite matches the restorative powers of a well-crafted Bloody Mary, especially one topped with a slider/shrimp/bacon/slider kebab. 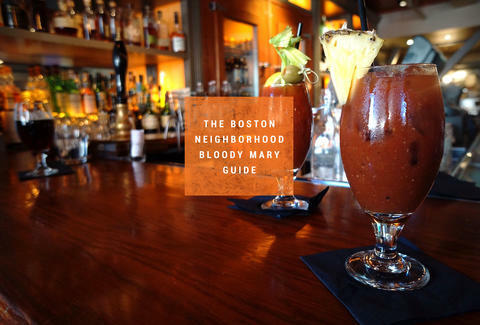 In the endless search for easy weekend mornings, we rounded up the best Bloody Marys in 16 Boston neighborhoods. 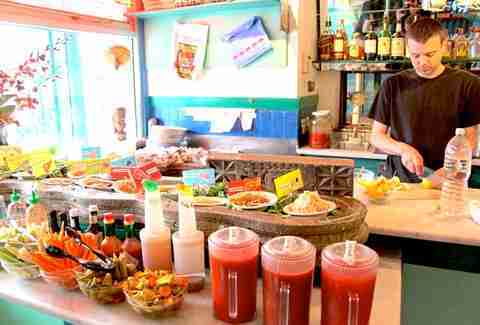 Allston’s favorite hangout heads deep into the heart of Texas for the diabolical Bloody Maria. Poblanos and cilantro fuel the house-infused Agavales Reposado tequila, while the chipotle-Tabasco spicy Mary mix throws more gas on the fire. For an extra buck, order it "Dallas-style" (like a Ewing) with a skewer of house-smoked sausage, pickles, and cheese. Common Ground’s Green Mary could be the "healthiest" Bloody around thanks to heavy doses of dark, vitamin-rich greens. You’ll be strong to the finish as you knock back triple-infused spinach vodka, zesty house-made mix, spinach leaves (lining the glass), and three gigantic feta-stuffed black olives. Perfect pairing: the all-you-can-eat Sunday brunch buffet for the low, low price of $15. Your decadent Southern French brunch (recently launched at Bistro du Midi) wouldn’t be complete without the signature Bouillabaisse Bloody Mary. Already a head turner, Mary’s Provencal makeover amps up the fancy with aromatic saffron-scented seafood broth, tomato, anise, fresh horseradish, Pearl vodka, and one very happy-looking seared prawn. Fairsted Kitchen becomes Shermer High for its Breakfast Club-themed brunch cocktails, and this is one Sunday detention you'll actually look forward to. 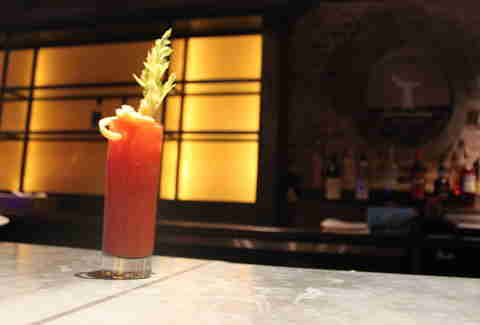 Neo Maxi Zoom Dweebies will revel in The Basket Case: Fairsted’s Grade A Bloody Mary elevated by tequila, celery puree, and house-made smoked tomato juice mix. Don’t mess with the bull, young man. You’ll get the horns. 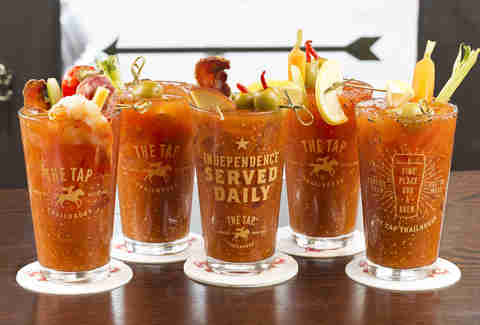 Your brain might still be foggy, but muster whatever brainpower you can for Tap Trailhouse’s extensive "Build-a-Bloody" menu. Earthy smoked paprika and mustard-spiked tomato juice forms the base, followed by craft spirits (i.e. Grand Ten Fire Puncher), some heat and tang (house habanero), a rim (cayenne bacon), any additions (North End Soppressata), and, finally, some tried-and-true garnishes (celery, lime, lemon, olives). Hard work has its rewards. 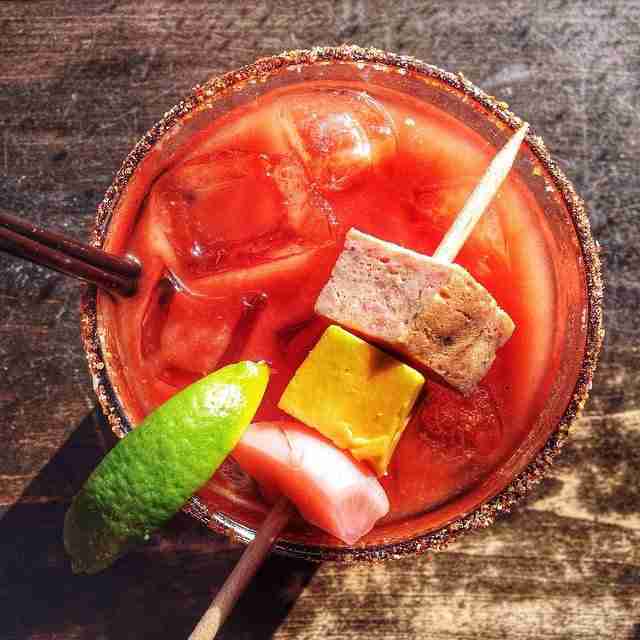 Wear some plaid and pretend you’re Norm Abram for Cask’s fully equipped "Build Your Own Bloody Mary" workshop. Your project begins with tomato juice and the house "mud mix," then you add embellishments like your favorite spirit (Tito’s, Hendrick’s) and a flavor-booster rim (smoked salt & pepper). Garnishes like pulled pork sliders and chocolate-dipped bacon expand your Bloody into a full-meal deal. The best things come in "threes" (wishes, company, Destiny’s Children), as do Russell House Tavern’s Bloody Marys. Sobieski vodka smooths out the classic version, while serrano-infused Xicaru mezcal scorches the Mezcal Mary. Complete the trifecta with Maria Basilico, a refined and slightly orange-y revelation with basil-charged vodka and Meletti amaro. With a bazillion ingredients and infinite combinations, East Coast Grill’s DIY Bloody Mary bar is the brunch equivalent of Choose Your Own Adventure. Go large (for extra space), load up your masterpiece with a garden’s worth of house-pickled vegetables, and crank up the heat courtesy of ghost chili jam and/or the signature Inner Beauty Hot Sauce. It’s geometrically impossible to add everything, but we won’t hold you back. Looking for bacon fat-infused vodka? Of course you are, and Catalyst delivers it with its Bloody Mary cart, arriving tableside and jammed with goodies, both foreign and domestic. Exotic toppers include shishito peppers, house-made jerky, duck prosciutto, serrano ham, and Sriracha cream cheese olives. You’ll always find substantial cocktails at this North End hotspot, and the eponymous Ward 8 Bloody is no exception. This smoky/meaty wonder gets its mojo from bacon-infused Tito’s vodka, house-made bloody mix, and a thick-yet-crunchy bacon strip. Simple and to-the-point. Match that up with the lobster "hole," a stunning breakfast sammy with fresh-shucked lobster and black truffle mayo on griddled brioche. What’s 23 whopping ounces and served in a hefty glass chalice? It’s Cambridge’s Biggest Bloody, a Hulk-sized waker-upper, and it’s all for you. Christopher’s maintains Pentagon-level secrecy regarding its spicy tomato juice mix, but some say it’s Dijon mustard that propels the extra zip. 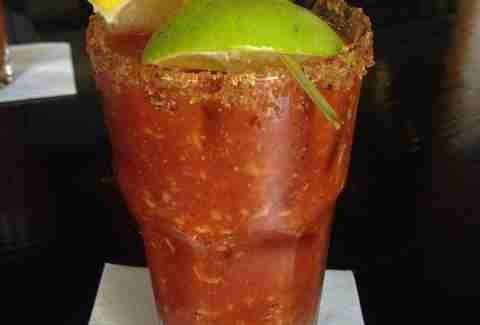 If Steve Zissou and Bartholomew Quint designed a Bloody Mary, it would be Barking Crab’s Bloody Crab. This hot and briny concoction dives deep with San Marzano tomato juice, freshly grated horseradish, balsamic vinegar, Old Bay, tricolor peppercorns, and cayenne. And, naturally, you’ll find shrimp cocktail and a Dungeness crab claw and leg swimming around the rim. You’re gonna need a bigger belt. Brass Union is also rocking one of those so-simple-why-is-it-so-good Bloody Marys. Standing tall in a Collins glass, Union Bloody achieves the ideal ratio of vodka to "you can taste the campfire" tomato juice (from tomatoes roasted in an old oven-turned-smoker). It’s also an ideal companion for the chicken confit Benedict or chorizo omelet. 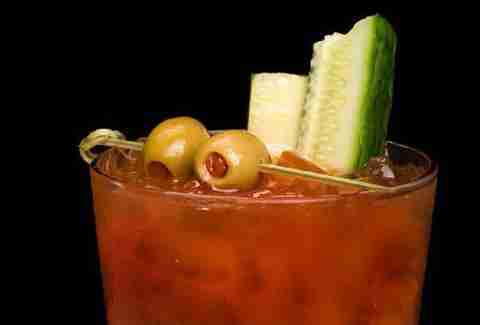 Bloody Marys are distinctly American beverages, but they travel extremely well, like all the way to Italy. Exhibit A: Nebo’s Howling Mad Mary. For a unique twist on the classic, the mixmasters here soak Italian pepperoncini in Tito’s vodka and then go full-Vesuvius with "spicy-mad" Bloody Mary mix. Use Nebo’s must-try cool/creamy burrata to put out any fires.